Samir Nasri seems re-born this season on loan at Sevilla, however, he has remained adamant on his decision to never play for his International side even if he does receive a call-up. Nasri has been in impressive form for Sevilla this season, after completing a loan move from Manchester City in the summer. His performances have prompted rumours that he may receive a call-up to the France National team soon. However, the 29-year-old, who hung up his International boots in 2014, remains stubborn on his decision to never play for his nation again. Nasri has earned 49 France caps throughout his career, but after being left out of Deschamps’ FIFA 2010 and FIFA 2014 World Cup Squads, the Frenchman decided to end his International career, at the age of 27. Rumours about a potential France call up began circulating as the 29-year-old regained his top form with Sevilla. 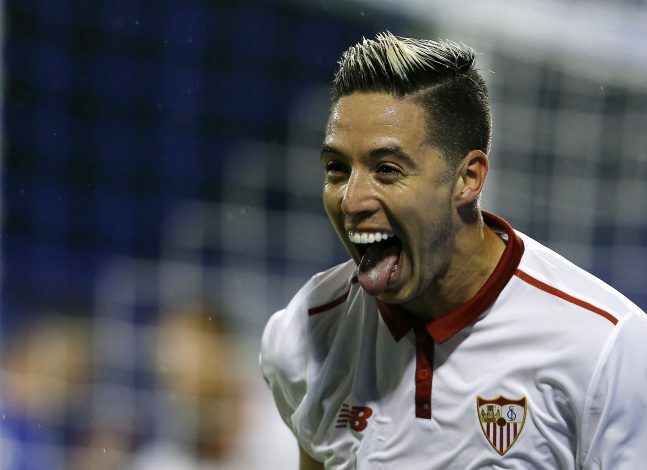 Nasri has scored 3 goals in 8 games for the Spanish club, thanking Sevilla boss Jorge Sampaoli for his rise in form. He spoke about how Sampaoli allows him to play as a central midfielder, pinpointing this as the reason behind his sensational form. “At Marseille, I always played as a central midfielder, sometimes deep-lying and sometimes further forward. Only when I went to Manchester City and a little bit at Arsenal did I play on the wing. “My favourite position is holding midfield because I can get on the ball and be at the centre of the team.